This exotic fan will evoke a worldly vibe. It features blonde toned bamboo wood with floral cutouts throughout. It is a natural and simplistic with a lot of character and detailing. An Asian style tassel dangles from the bottom. Please note the tassels come in assorted colors. The tassel adds a pop of color and extra flair. A single screw at the base of the fan holds everything together. It is not only beautiful but functional as well and can easily be opened and closed. A great way to look divine when fanning off in the heat. Perfect for themed parties, costumes, dance and theater groups, photo prop, and decorations. The sky is the limit for the numerous uses for this fan. Additionally, it can be used as party favors and prizes. 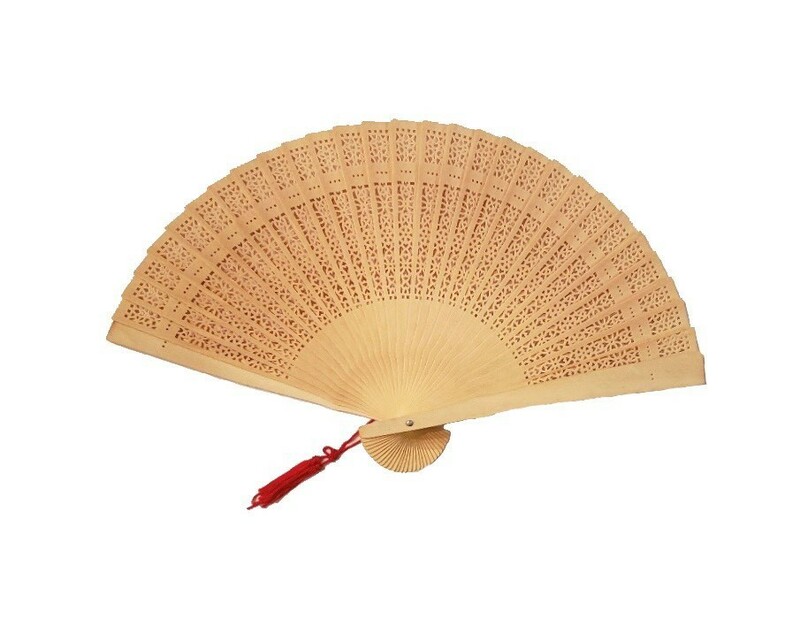 This unique fan is made from 100% Wood. It measures approximately 9 inches (23 cm) tall by 14.75 inches (37 cm) across when open.